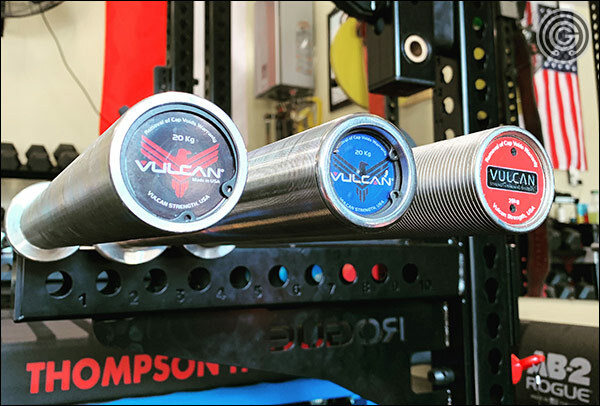 Vulcan Strength currently offers three different power bars; the Elite Power Bar, the Vulcan Absolute Power Bar, and the Stainless Steel Absolute Power Bar. All three of these power bars are what I would consider to be premium pieces of equipment, and while they certainly do have their share of similarities (as the majority of mainstream power bars do), they’re all very unique indeed; each rivaling a great many of today’s most popular power bars. So what makes these three Vulcan power bars different? 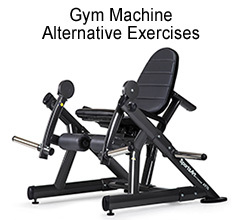 and which of them; if any of them; is the best option for you and/or your gym? In this review I am going to cover the technical specs of these power bars, discuss the feel and performance differences between them, give my own personal opinion of each bar and what I think of them, and occasionally even compare them to other popular power bars that you may be considering alongside these bars. The most affordable of all three Vulcan Power Bars is the Absolute Power Bar V2. Priced at just $339, the Absolute is a 29 mm, 221,000 PSI power bar with flawless knurl. 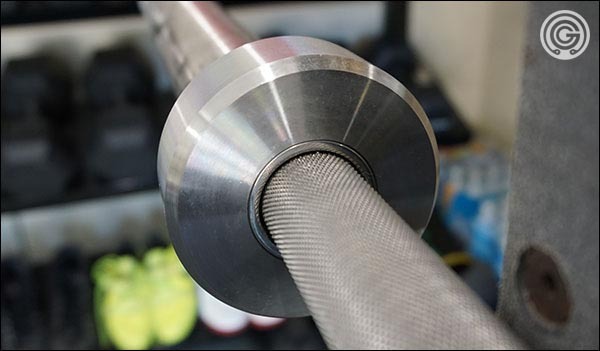 It features a black oxide shaft that nicely compliments the grippy knurling, and a uniquely grooved flat-fin sleeve design this is itself finished in an attractive and resilient dense chrome. The Absolute V2.0 is hand’s down one of the best power bars on the market; not just for the money, but overall. 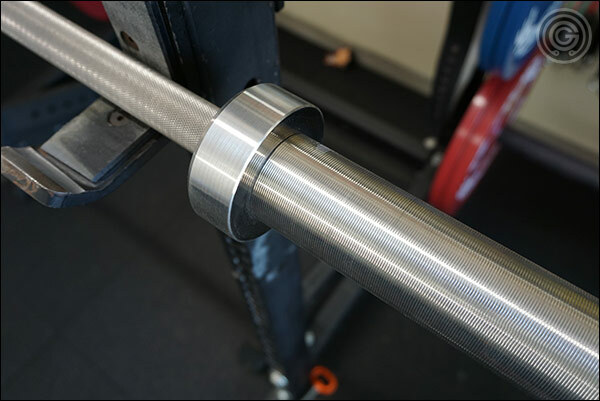 The strength of the bar is much higher than average, the center knurl is a little toned down when compared to the outer knurl, and that outer knurl is aggressive and sharp without being over the top. 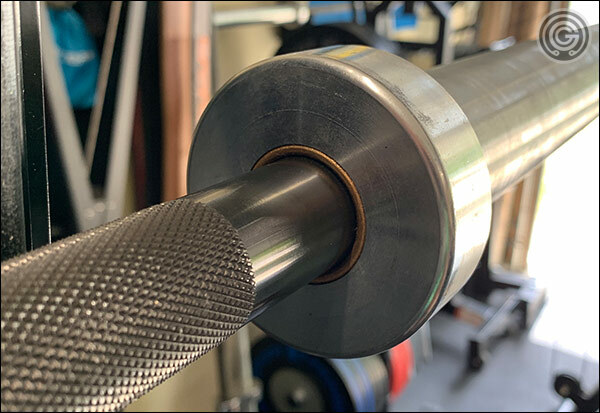 As I mentioned in my review of the Absolute, the knurl is a little less coarse and painful than what is found on the Ohio Power Bar, and the center knurl is a lot less painful to back squat or power clean with. The Black Oxide Absolute has a 4.9-star rating based on 17 reviews. Honestly I consider it to still be a 5-star review because there are only two 4-star ratings in the whole list. The first complained that the end cap doesn’t have the Vulcan eagle and the other was that the bar’s center knurl wasn’t as aggressive as the outer despite it being more aggressive than it even needs to be. These are not problems, as the Absolute is a beautiful, rigid, high-performance power bar for not a lot of money. Hell the price even includes the shipping. Incidentally, the newest batch of Vulcan Absolutes does have the Eagle art work on the end caps! (see above Instagram image). Ask and you shall receive, I suppose! I absolutely recommend the Vulcan Absolute V2.0. 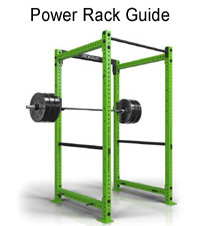 It is just as much bar as the Ohio Power Bar while being more comfortable to have in the hands, more comfortable to high-bar squat with, quieter to deadlift with, stronger, and if I’m being honest, just classier looking. This bar is unquestionably a fantastic piece of equipment, and one that I will never part with. At about $550, the SS Absolute is not quite as affordable as the standard Absolute, though it is one hell of a premium power bar. It sports an insane tensile strength rating of 240k PSI, a knurl nearly as aggressive as an SS Ohio Power Bar, and just like its little brother it does have a slightly less aggressive center knurl. This bar is pretty much entirely constructed from stainless steel. It’s not just the shaft as per usual, but also the sleeves and bushings. This bar is grippy, rigid, rustproof, and practically indestructible. It won’t bend, deform, break, seize, or lose its attractiveness. There’s no slop in the sleeves, it’s not over-priced, and frankly it’s just about as beautiful as they come. For what it’s worth I think this is a better buy than the Kabuki being that it’s stainless rather than finished, priced $50-$100 less (not the cost of shipping from KB), and comparable in terms of the specifications. The SS variant only has a couple of reviews, which surprises me because I know of a lot of folks who own this bar and they all love it (I do too.) It still has a perfect 5-star rating, and I’d personally give it the same 5-star rating if I left product reviews anywhere but here. Even though the price isn’t unreasonable, the SS Absolute is still expensive. 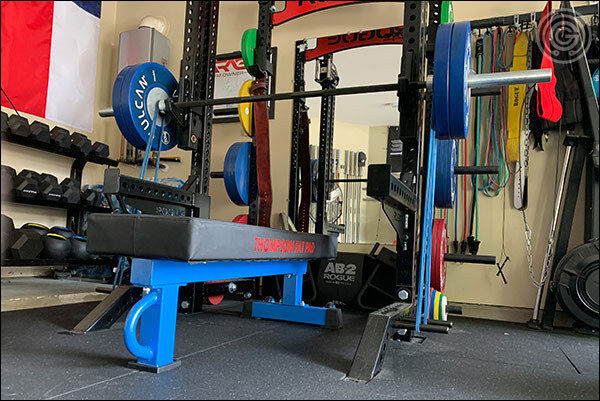 I think that this variant is a nicer bar overall than the black oxide Absolute, and I do completely recommend it, but don’t think twice about going with the less-costly Black Oxide Absolute if your budget doesn’t allow you to drop $550 on a new bar. Just know that you can’t go wrong with either version; they are both incredible bars at fair prices. Now that we have summarized the reviews for both of the Absolutes, let’s turn to the Vulcan Elite; the most intensely knurled power bar that I’ve ever put my hands on. 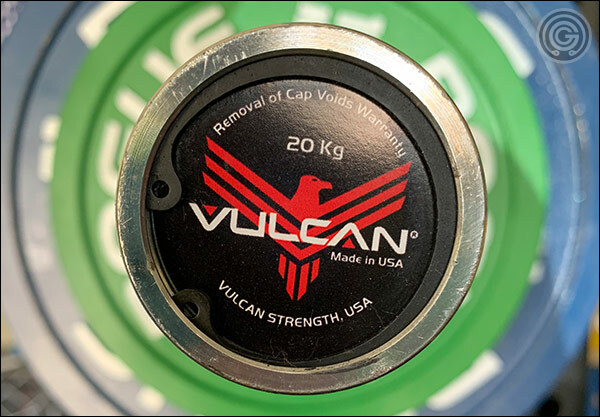 The Vulcan Elite is the only Vulcan power bar (and one of the few power bars among power bars) to use Oilite branded bushings. Oilite bushings are basically just a premium version of the bronze bushing. 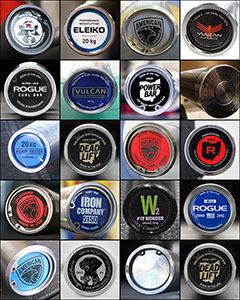 We don’t see them being used all that often because they are generally only found in USA-made bars and very few bars outside of Rogue’s and American Barbell’s bars are made in the USA (neither of which use Oilite bushings by the way). So does this matter? Well yes and no. Oilite bushings are sintered; meaning they’re porous and self-lubricating. That is, they store more lubrication within the bushing, and they’ll retain that lubrication for longer. All this just equates to a more reliable spin and less maintenance for you, the owner. So in that sense the use of Oilite bushings do matter. Where it doesn’t matter is that we’re talking about a power bar here; a bar that doesn’t need a bunch of spin. 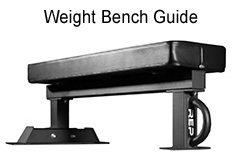 If you’re not pushing huge weights you probably won’t notice the difference in performance. Even if you are you probably still won’t notice unless you’re power cleaning or something. Still, I personally prefer a sintered bushing. I strongly believe that they are the main reason the original York B&R bar is still preferred to the current B&R. 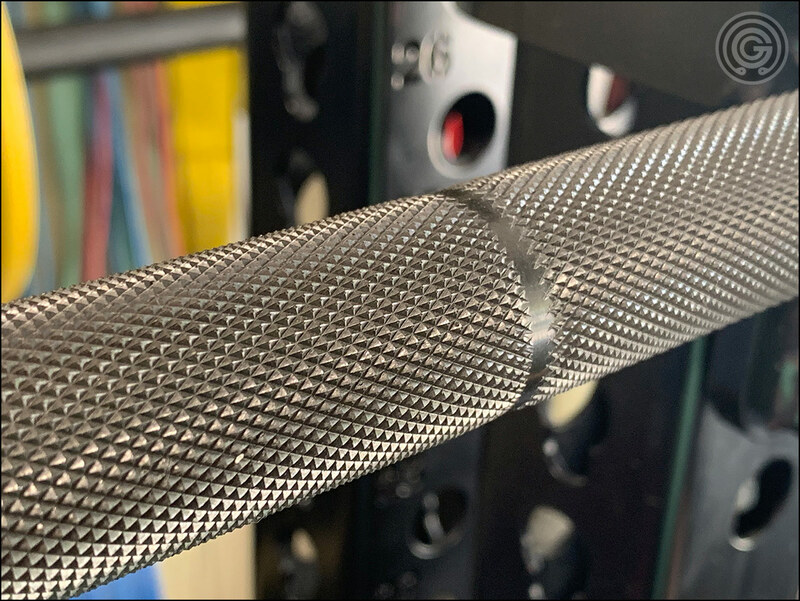 I kid you not, the knurling on this bar is insane. It is by far the sharpest bar in my collection. This bar should probably be an auto-buy if you don’t think that your current Texas Power or Ohio Power Bar is aggressive enough, as I don’t know of any other bar with this much bite. A bar with shark teeth may be appealing to some, but I don’t think that the majority of lifters are looking for a bar this aggressive. Unless the palms of your hands are just one big callus (or you want them to be) I wouldn’t exactly recommend this bar to you. 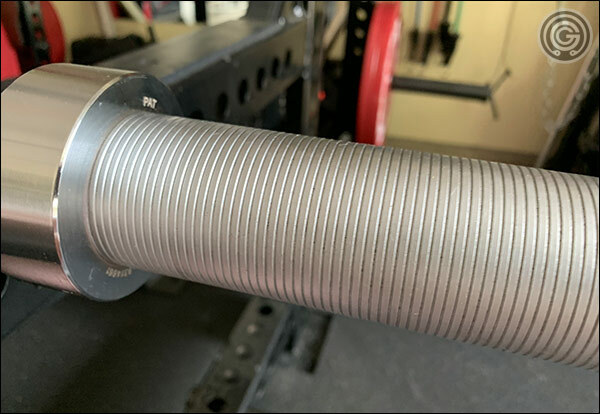 It is a perfect match for a small sect of powerlifters who are into knurling this intense, but the average gym rat is going to find the Elite to be a bit extra. Seriously, if you are not already into a super aggressive knurl then this bar is simply not for you. 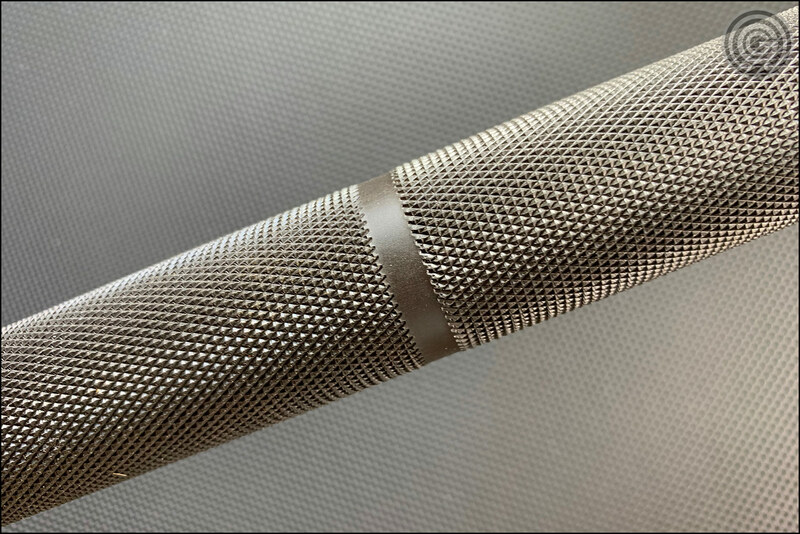 The knurling of the Vulcan Elite is not subtle. 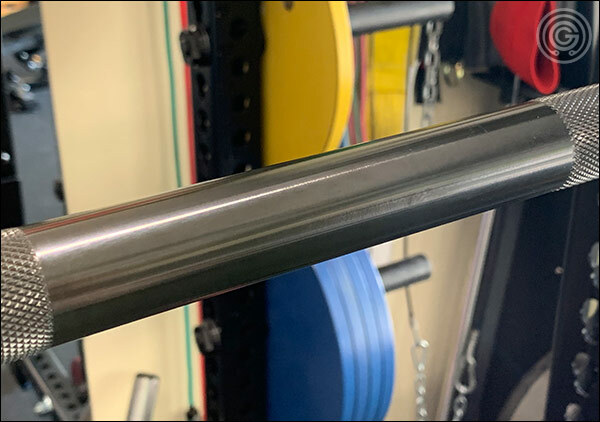 The Elite has an average tensile strength rating; lower than both of the Absolutes and lower than all versions of the Ohio Power Bar; yet somehow it has one of the stiffest shafts in the industry. The Elite has zero flex at low-to-moderate weights and still close to no flex at even heavy weights. It’s really phenomenal how stiff this bar stays even when loaded to the hilt. Chalk is pointless. It makes no difference as the points of the knurl literally dig into the palm of your hands. If you don’t pull with a deadlift bar like I normally do then the Elite is certainly a solid power bar option. It has a grip like no other power bar that I own. I didn’t mind non-deadlift pulls with the Elite (like barbell rows). The uber-aggressiveness of the knurl isn’t nearly as uncomfortable as it can be for deadlifts (especially for reps); being that the weight isn’t as high. 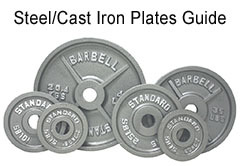 Of course, heavier rows and long sets might start to feel a little bit uncomfortable. I high-bar squat so I wasn’t a fan. I don’t even like the Rogue Ohio Power Bar for squats so there was pretty much no chance I was going to favor the Elite over any of my favorite bars when it came to squats (I actually squat with a Mammoth). That said, low-bar squatters might actually like all the extra grip of the Elite’s center, and not find it any more uncomfortable than their current Ohio, Texas, Kabuki, or Eleiko power bars. I liked how secure the Elite felt in the hands. 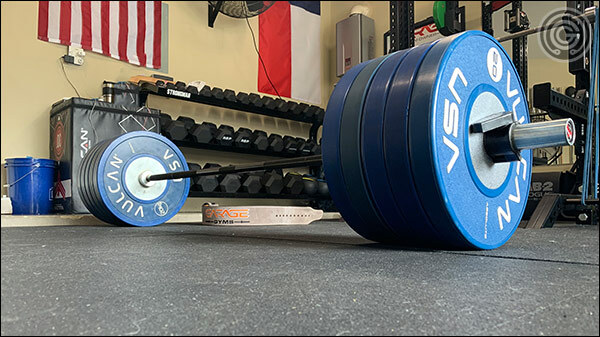 Heavy singles are great with the Elite because you’re not holding on to the bar long enough for it to start to hurt, and hurt is does if you are repping anything remotely heavy. 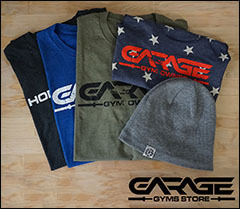 I found that longer sets at anything beyond about 225 becomes uncomfortable; to the point of almost being painful; and just about any pressing set you do will leave a big imprint of the bar’s knurl on your palms. As much as I liked the Elite for shorter, heavier sets, we don’t press 100% of our max every time we bench (well, I don’t anyway.) I don’t know that I’d want this to be my only power bar even if I like it for all other lifts. It should be noted that I’m not afraid of an aggressive bar. I actually really like a bit of depth to my knurl. That said, I still recognize the extreme nature of the Elite’s knurling. It is a great bar for those who can appreciate this level of sharpness, but that is certainly not everybody. Well it is safe to say that the Elite is its own bar when compared to the two Absolute Power Bars. All three Vulcan power bars may be aggressively knurled, high strength, and premium but the Elite certainly has a unique feel to it. It is its own bar 100% thanks to the knurl depth and sharpness. I tend to think of the Elite as more of a niche power bar; an amped up version of what would be considered normal for power bar knurling. 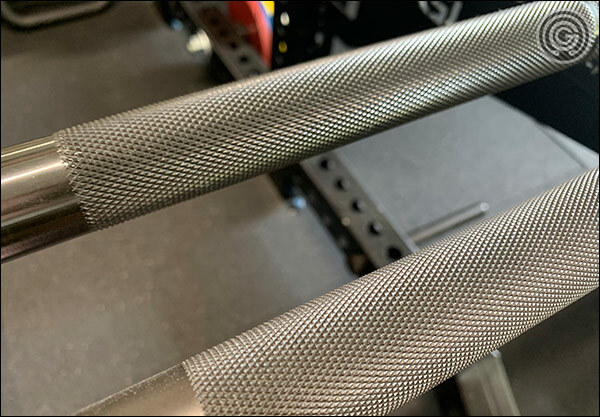 It’s kind of like how the American Barbell bars like the Mammoth and Grizzly are toned down power bars in terms of their knurling. 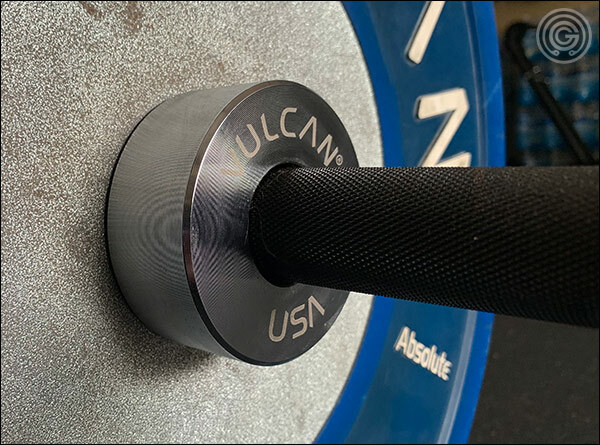 It’s nice that these options exist because one size definitely does not fit all, but when it comes to the Vulcan Elite I believe this bar will appeal to a much smaller audience than the mildly knurled power bars from American Barbell do. 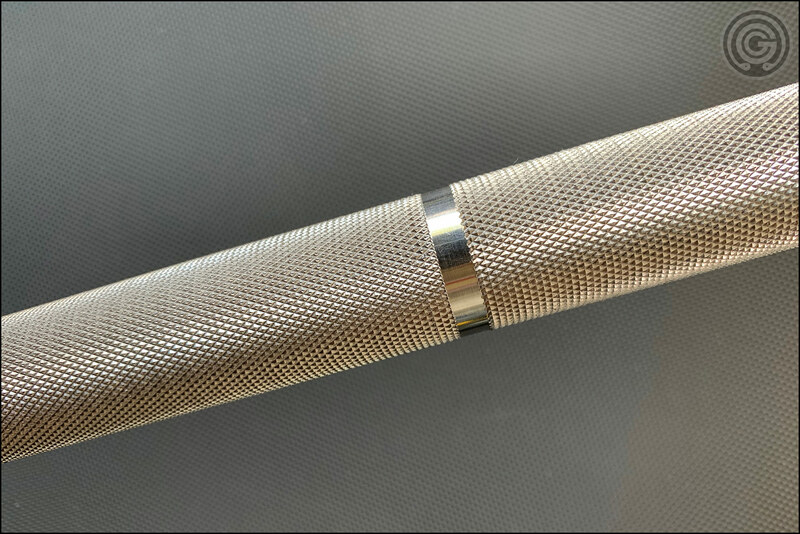 It’s okay though, because for those of you who aren’t looking for a mildly knurled power bar I truly believe that the Absolutes are the way to go. 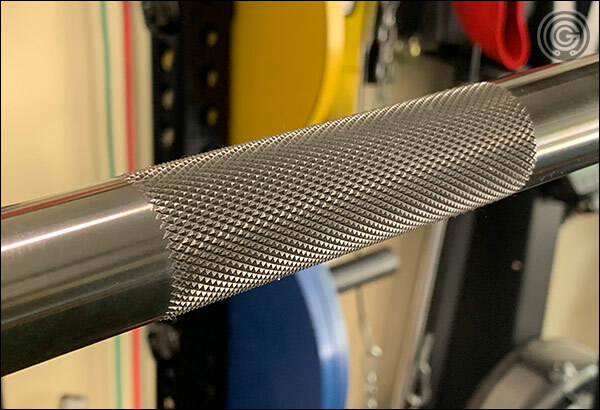 I personally prefer either of my Absolute Bars to the Ohio Power Bar because of how aggressive the Ohios center knurl is, and I like the knurling of the Absolutes more than I like the Texas Bar knurling; though I will admit that it’s a close call when it comes to the Texas Power Bar. I have literally no problems getting behind any of these power bars. Like I said, I do believe that the Vulcan Elite caters to a very specific audience, but I still think that it’s a fantastic bar for that particular audience. Yes it’s a bit much for my tastes, but I still recognize it as a solid piece of equipment. The Absolutes are going to be my recommendation for most athletes; at least for that large group of lifters who are looking for a stiff, reliable power bar with a fairly aggressive knurl. 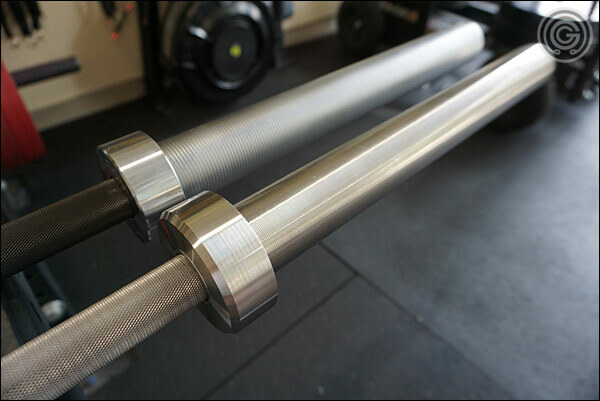 I think this is most people; be them novice or veteran; but I also realize that many people will gravitate towards the moderately-knurled power bars like those in the American Barbell line up. I just can’t say enough nice things about the two Absolutes. They feel amazing in the hands and they are both extremely beautiful pieces of equipment; the Oxide Absolute with its flat-fin, dense chrome sleeves and laser etched collars, and the beveled collar and full stainless luster of the SS Absolute. 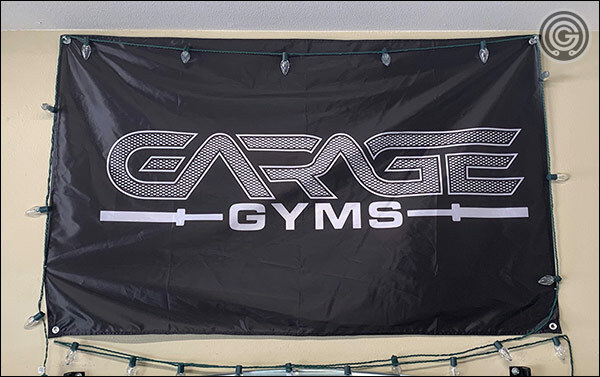 They’re both stiff as any bar you’ve lifted, they’re both reasonably priced considering their specifications, and they really do rival the competition. You may not end up buying a Vulcan but I think you’re making a mistake if you don’t at least check these bars out and consider them. Great review! I’ve been deciding on if I want a second bar and both absolutes are on my list along with the AB mammoth and elite. So many choices. My only concern is oxidation of the black oxide. I’m unsure of how much maintenance really will be required out here in humid GA but that bar just looks amazing. Once per month or weekly…idk…if the grip outweighs the inevitable oxidation, I may go for it. I probably won’t have a wall of bars so my next bar may be one of my last for a few years. oan…I don’t understand people who complain about end caps. I’ve literally seen my end caps a few times and I’ve had the bar for 2 years. I just don’t stare at end caps or notice them when working out. You know, I had the previous generation of the oxide Absolute and I noticed far more oxidation on that one than this one. Matter of fact, I don’t really see any oxidation on the V2 at all. That’s not to say it won’t, because it inevitably will, but either it’s thicker than it was before or it’s just a better application. Also, the oxidation only tends to really occur where you’re handling it. All the oxidation on my older one was right where my grip is. So maybe you oil it every other week and you’d be fine for years to come. It is a great bar though, no doubt about it. I agree about the end caps. My favorite AB bar has one end cap that doesn’t look at all like an AB logo anymore, but it’s still my favorite bar. Who cares. I know what bar it is!